FISH EGGS - THE PERFECT FOOD? Declining numbers of oceanic zooplankton cannot be entirely accounted for by the climate-warming-induced slacking of upwelling currents. For example, the North Atlantic ocean offers a picture today of unusually low zooplankton numbers in the presence of unusually high phytoplankton numbers, a finding which runs directly contrary to expectations. The life histories of common zooplankton organisms (e.g. copepods) reveal that while juvenile stages are herbivorous, adult stages are not. They are frequently omnivores or carnivores. The reproduction of herbivorous zooplankton therefore is not solely related to the availability of plant food. The abundance and quality of carnivorous food available to the adult stages also impacts directly on the successful reproduction of the herbivores. Pelagic spawn released by marine fish and invertebrates is accessible food to these carnivorous zooplankton. The massive reduction in "spawning stocks" of multiple marine species that has been induced by human fishing is therefore plausibly implicated in the current declining numbers of zooplankton. Spawn production in the ocean has obviously declined with the elimination of spawning fish, and this gradual withdrawl of a rich carnivorous food supply to the zooplankton may have negatively affected their ability to reproduce. It also follows that total new organic production (and carbon fixation) in the marine system will have been reduced. The widespread declining trend in age and size at maturity in marine fish and invertebrate species possibly represents a systemic reaction to the falling density of zooplankton, in the form of an increased effort to produce spawn in compensation. If fishing has "undercut" the zooplankton in this manner, and it seems entirely plausible that it has, then one "unintended, unanticipated negative consequence" of continued fish removals will be the collapse of virtually the entire marine ecosystem. Continuing to focus our explanatory efforts solely on temperature changes and "global warming," despite remarkable inconsistencies between predicted and observed effects, merely continues a long-ingrained human thought pattern of denial...denial of the full impact of our ruthless destruction of marine life...and perhaps denial that many of our earlier theories about how the ecosystem functions are now proving to be, to a rather significant extent, incorrect. For example, the concept of energy flowing in only a single direction in marine systems, upwards through successively higher trophic levels, is challenged by consideration of the significant quantity of energy that is actually channelled directly downwards in the form of marine spawn. Although it inevitably dissipates, energy can be seen to follow many circular routes within the ecosystem, cycling along with nutrients. In this way, animate marine life in total acts as a catalyst for the continuation of high rates or primary production...a greater abundance fish in the sea, therefore, ultimately results in a higher rate of marine carbon fixation. This explanation for the lower numbers of zooplankton is initially a plausible one. The sequence of events is believed to be that weaker upwelling forces make less nutrients available for the stimulation of phytoplankton growth. The effect of this on the herbivorous zooplankton is that they therefore experience a degree of food shortage, and the result is a decline in their numbers. Since the mechanism of zooplankton decline is believed to be a shortage of phytoplankton food, presumably the Californian study also found relatively low levels of phytoplankton. But I have not found reference to this particular aspect of the story. One finding that would seem to strongly contradict their hypothesis, however, would be if an increase were discovered in the standing stock of phytoplankton. Declining zooplankton populations in the presence of normal, or higher than normal, levels of phytoplankton growth, would imply that some other factor is involved and also exerting a negative effect on the growth of zooplankton. "- The colour index for the Scotian Shelf derived from the Continuous Plankton Recorder (CPR) data showed a large increase in the 1990s compared to 1961 - 1975 that was due to an increase in the numbers of diatom and dinoflagellate phytoplankton. - The CPR numbers of the early stages of the copepod C. finmarchicus and the total copepod numbers showed a general downward trend in the 1990s compared to 1961 - 1975. - The CPR total numbers of krill (euphausiids) in the 1990s were below the long-term mean." One problem with this explanation is that the cold temperatures noted in the early 1990s were over by the mid 1990s, and water temperatures in recent years have been at or slightly above long term means. The same cold temperatures in the early 1990s were also once "believed to have played a role" in the crash and failure to recover of the once huge groundfish stocks in the same area. It was predicted in the early 1990s that cod and other fish would begin to grow better once the temperature returned to normal…but that is not what happened. The fish stocks overall have simply continued to decline. It seems more likely that there may exist a direct link between the disappearing fish stocks and the declining zooplankton stocks, than that a transient cold spell a decade ago was an important cause of either. One side of the feeding relationship between fish and zooplankton is very well understood, and this is the fact that fish eat zooplankton. Virtually all fish depend on zooplankton as a food source during their early life stages, and some fish feed on it for their whole lives. But a close look at the habits of zooplankton reveals that, possibly to a very significant extent, many zooplankton also eat fish. By ‘eating fish’ I mean consuming their offspring. Zooplankton are significant predators on the eggs and larvae of fish species that release pelagic eggs, and this includes the majority of fish species. It is important to note that many species of zooplankton (including the highly abundant calanoid copepods and chaetognaths) commonly shift their diet from herbivorous as juveniles to omnivorous or carnivorous diets as reproductive adults. And that the numbers of their offspring is known to be directly related to their level of nutrition. Better fed copepods produce larger batches of eggs. (Steidinger and Walker, 1984) Therefore, the successful reproduction of these ‘herbivorous’ zooplankton depends not only on an adequate supply of phytoplankton, but also on an sufficient supply of appropriately sized ‘animal’ food. Phytoplankton functions best, it seems, only as ‘baby food’ for many zooplankton species, therefore a vigorous population growth cannot be expected if that is the only food that is provided in abundance. The long recognized spring bloom of phytoplankton in the North Atlantic is well known to be followed shortly thereafter by a marked increase in the zooplankton abundance…therefore simple cause and effect have been assumed. While it is fairly certain that the heightened supply of phytoplankton contributes to the zooplankton population growth, it bears pointing out that a supply of planktonic carnivorous food also normally ‘blooms’ in the spring, coinciding with the blooms of phytoplankton and zooplankton. The release of pelagic spawn by a multitude of marine species, both fish and invertebrates, also increases sharply at this time of year. Most of this spawn is consumed within the plankton. While zooplankton certainly consume many carnivorous foods besides spawn (e.g. smaller zooplankton, bacteria), fish eggs may represent the most nutrient dense items available, and the infusion of billions of floating eggs and sperm into the plankton may represent a significant source of food to these tiny carnivores. The combination of ‘physical forcing’ (via the mixing induced phytoplankton bloom) and ’biological forcing’ (via the seasonal ‘bloom’ of floating spawn) may therefore be what is needed to produce optimal growth of the zooplankton population. Dramatic declines in spawning stocks have occurred in virtually all commercially fished species in Atlantic Canada (and elsewhere). It follows that the quantity of their spawn released into the ocean has declined in a similar manner. Disturbingly, unexploited spawn producing species have also recently been noted to be in decline, for example look at barnacles. Could this downturn in overall pelagic spawn production be large enough to be felt as a food loss by the zooplankton community? "PHYSICAL FORCING" vs "TIGHT CYCLING OF NUTRIENTS" - two different dynamics known to drive marine primary productivity….is it one or the other, or is it both? It seems more likely now that the total quantity of new organic material that can potentially be formed in the photic zone depends not only on the amount of nutrients regenerated by physical mixing of the deep waters, but also on the total quantity of living organic material (fish, for example) that already exists within the photic zone. The living assemblage itself effectively acts as a catalyst for new production. Energy and nutrients held within adult organisms are regularly channelled 'downward' in a manner that helps to stimulate growth and reproduction of zooplankton and phytoplankton, and accelerate uptake of new energy into the system...spawn production and consumption is an unrecognized route by which this dynamic occurs. The more organisms that inhabit the sea, the greater the capacity of the ecosystem as a whole to absorb whatever dissolved nutrients are made available, and to maximize the resulting potential for new organic production. The discovery of highly productive marine ecosystems (coral reefs) in the shallow, nutrient-poor tropical waters initially seemed to present a conundrum. Because physical mixing generally does not occur in these areas, it was not initially obvious to scientists what process was driving such high productivity. Study of the tropical organisms, however, revealed that the secret to their productivity lies in the complexity of the elaborate symbiotic relationships that exist between species. ‘Give and take’ relationships exist on many levels, with the effect that the living community as a whole has a strong tendency to conserve nutrients once it gains possession of them. Nothing is wasted; nutrients are cycled repeatedly, allowing ongoing photosynthesis in the absence of physical mixing, and boosting productivity to higher levels. This pattern has been described as "tight recycling of nutrients" and it allows for the continuation of significant levels of primary production in very thermally stratified, nutrient-poor tropical water. In contrast to most scientific writing on temperate fisheries, standing stocks of fish have actually been perceived as being significant nutrient reservoirs in scientific analyses of tropical fisheries. Their removal has been described as being a possible cause of lowered productivity due to their role in nutrient cycling. (Polunin and Roberts, 1996). But tropical and temperate marine species belong to the same families of organisms…all are simply variations on a few common themes…as are the varieties of marine ecosystems on the planet. And if tropical marine assemblages tend to conserve and recycle nutrients as an organizing principle that augments (or completely replaces) physical forcing of productivity, why would this not also be true of their temperate cousins? The coral-zooxanthellae symbiosis is an arrangement unique to the tropics, but what it accomplishes - an efficient short circuit that neatly passes vital nutrients back and forth between plant and animal - is not. What do the "tight cycles" look like? One "tight cycle" involves the direct fertilization of the phytoplankton by all other creatures in the sea. Marine organisms living at all trophic levels above the primary producers excrete dissolved nutrients into the water that are ideally suited to fertilizing the phytoplankton. Very often this is ammonia, which all fish excrete from their gills. This has sometimes been recognized in the literature as a significant route of nutrient regeneration in surface water, but usually only the contribution of the zooplankton has been acknowledged. Recently a "microbial loop" dynamic has been appreciated in marine food webs, one effect of which is the regeneration of nutrients into the photic zone. (Nybakken, 1997) All larger fish, however, also contribute in the same manner to this ongoing stimulation of primary production. Patterns often repeat in nature. The dual and complementary effects that zooplankton have on phytoplankton (predation and fertilization) are repeated in turn in the effects that their consumers have on the zooplankton population. Of the many fish and invertebrate species that feed on zooplankton, the vast majority also release pelagic spawn, and their eggs and larval stages then serve to offer high quality food in portions small enough to be captured by many of the larger zooplankton organisms, This short feedback loop, a level removed from the primary producers, has the potential to increase the efficiency with which the web as a whole incorporates the products of primary production into the carnivorous web. This is because well nourished (carnivorous) adult zooplankton will produce larger numbers of herbivorous offspring, thereby grazing the phytoplankton more completely and allowing less of the products of photosynthesis to sink to the bottom. Thus the existence of the ‘downside’ of the second loop (fish spawn nourishing zooplankton) enhances the overall efficiency of the first loop (zooplankton consuming and fertilizing phytoplankton). Therefore, the existence of healthy, intact populations of consumers higher in the food web can be seen to enhance overall productivity - such an ecosystem is better positioned to take advantage of nutrient pulses provided by physical forcing and enhance and prolong the resultant productivity by "tight recycling of nutrients" or "biological forcing." The ecological significance of marine spawn deserves a closer look. Most scientific attention that has been paid to fish eggs and larvae has been focused on the survivors, often on the tiny fraction that ultimately "recruits" to a commercially exploited fish stock. But "recruitment" is the rare outcome, practically all spawn produced effectively serves a different ecological purpose. By becoming part of the zooplankton, it nourishes either other zooplankton organisms or the species that feed on zooplankton, such as juvenile (or adult) fish. Once the consumption of spawn and juveniles is added to the marine food web diagram many "tight" nutrient cycles can be appreciated inside the overall scheme, and all of these short feedback loops have the ‘side-effects’ of conserving nutrients within the living web, while steadily regenerating nutrients directly into the water of the photic zone. A lot of trading back and forth occurs between various species. The labels "predator" and "prey" can be seen to alternate between species, depending on which life stage is being considered. In temperate seas groundfish (gadoids, flatfishes) and small schooling pelagics known as "baitfish" (herrings, capelin, etc.) are two historically very highly abundant fish families. A large fraction of the total ‘fish production’ in the ocean was therefore channelled through these two species groups. A short cycle by which nutrients pass back and forth between these two groups appears to have been included in the design of the system. The "baitfish" (herrings) are primarily plankton feeding fish as adults, that are ideally equipped to strain out free floating fish eggs from positions high in the water column. The eggs of the groundfish (cod, haddock, etc.,) are typically pelagic, floating high in the water column where they present themselves as an ideal food source for the "baitfish." So the bottom fish send their eggs to the surface to be largely consumed by the pelagic fish. But there is a neat reversal of fate when the herring and capelin spawn. In what appears to possibly be a reciprocal ‘pay back’ design, the eggs of these fish sink to the bottom where they adhere to surfaces and to one another. The eggs of herring are piled many layers deep, to the point of suffocating those buried most deeply. This ‘reproductive strategy’ (producing a large mass of demersal eggs) on the part of the herrings may or may not confer particular advantages on their newly hatched young, but it clearly does confer an advantage on the groundfish that normally feed on them. Groundfish are unable to filter planktonic particles, so they can derive no benefit from free floating pelagic eggs, but they can and do take advantage of the clumped together sunken herring eggs. Groundfish are also well known to "be attracted to spawning sites specifically for the purpose of feeding." Dragger fishermen, at least in some inshore areas in Atlantic Canada, are well aware of the tendency of groundfish to congregate at herring spawning sites. A bottom trawl hauled through such a site will typically come up coated in sticky herring spawn and full of "spawny" ground fish (their bellies filled with herring eggs). The fishermen call this a "spawn tow." Since they cannot effectively prey on single eggs, groundfish are unlikely to "eliminate" patches of herring eggs. Their feeding may ultimately improve the survival odds of the young herring, however, since their feeding will break up the thick clumps and allow the survivors to be better oxygenated than they would have been in the undisturbed egg mass. The ‘reason why’ pelagic fish produce demersal eggs has been difficult to say with certainty. Demersal eggs experience lower predation mortality than do pelagic eggs, so apparently the groundfish are unable to consume the baitfish spawn to the same extent as the herring can polish off the floating cod spawn. Their overall relationship is not really unbalanced in favor of the herring however, since the feeding balance tips the other way when mature cod feed on older juvenile and adult herring. In the final balance, it seems that both families of fish evolved strategies to practice "sustainable harvesting" of the other…considering their successful coexistence for millions of years, and the immense numbers of these fish that existed in the sea prior to the onset of human exploitation. These few examples offer glimpses of ‘tight recycling of nutrients’ as it is done among the temperate zone fish stocks, and also clues as to the reason why so many fish stocks area failing together. They evolved together and none was meant to, nor is it capable of standing alone. HOW SIGNIFICANT MIGHT FISH SPAWNING BEHAVIOR BE AS A NUTRIENT CYCLING STRATEGY IN THE OCEAN? This is an important question. Does the spawn of fishes represent a minor and relatively insignificant fraction of the zooplankton…or is the biomass and nutrient transfer involved large enough to be considered significant? How important is a food that is only seasonally available? Can it represent a important portion of the diet, or is fish spawn only a trivial and occasional meal, not enough to have an effect on the overall nutritional health of the consumers? Considering that most food supplies in nature, certainly those in the higher latitudes at least, are only made available to their consumers on a seasonal basis, the fact that spawn only appears ‘in season’ does not argue against its importance as a food. Therefore, it appears that a severe decline in the numbers of mature fish and invertebrates in the sea might result in a noticeable lack of an "important" segment of the zooplankton. Seasonal availability covers most of the year. Therefore, if the egg or larval consumer is indiscriminate as to species consumed (which they are well known to be), the overall opportunity to consume this type of food is fairly substantial. How much spawn do fish produce? Of course this varies with the species , but it appears to range between approximately 10% and 30% of the biomass (wet weight) of the fish. The percentage is also referred to as the "gonadosomatic index" (GSI). 20% may be a reasonably representative figure. Considering that 20% by weight of the average spawning fish stock is diverted to the zooplankton, the bulk of the nutrient transfer might start to look significant…especially if we consider the immense spawning stocks of fish that existed prior to human exploitation. For every 100 tons of living "spawning stock biomass" (SSB), approximately 20 tons will be annually converted to zooplankton. The fish that divert the highest proportion of their resources to this use are the biggest, oldest spawners. This is well known. The larger sized fish put less energy into somatic growth and divert a larger fraction of their intake into ‘reproduction.’ Their own bodies growing only relatively slowly once they reach the larger sizes, the biggest spawners achieve not only the highest GSI and the highest number of eggs, but also the highest quality eggs and larvae (more yolk, stronger larvae) (Hempell). Both the quantity and the quality of fish eggs in the sea was therefore once much higher. Beyond the 20% by weight that mature fish divert annually to the zooplankton, the significance of the nutrient contribution increases once the protein and energy content of roe is considered. Fish eggs are very high in protein (making extremely nutritious food, as is well appreciated by their human consumers). The food value of fish eggs (by weight) is much higher than that of the fish that produces them. The density of protein and energy in the eggs is such that the fraction of the total nutrient content of a mature fish that is regularly diverted to the zooplankton can safely be assumed to be well over 20% of the total reserves held within the body of that fish. Therefore all mature fish, and to a greater degree as they become older, divert a significant portion of the nutrients and energy consumed into a recycling route that gives a direct boost to the plankton productivity and is almost guaranteed not to be lost to sinking/decomposition. The imperative to divert significant protein and energy stores into ‘reproduction/zooplankton replenishment’ appears to be quite intense in fish. Following spawning, fish are well known to typically be in their lowest condition (fat content) of the year. Protein previously incorporated into their own flesh may be drawn upon and diverted into egg production. This is evident from the "jellied" flesh that has been noted in several groundfish species post-spawning. Cod in Atlantic Canada have recently been deemed unmarketable due to the "jellied" condition of their flesh. This change in texture is the direct result of extreme protein loss in these fish. The diversion of protein and energy into egg (and sperm) production is therefore clearly a high priority biological activity for fish. It is possible that the biological trigger for early egg production is related to the depleted state of the zooplankton. Participation in the zooplankton, even if only temporary, is common to the life histories of the majority of marine species. If they do not survive this passage none of these species can continue. The contribution by all of them of large numbers of ‘extra’ spawn to the sea ensured an appropriate food density for all of their surviving young. The zooplankton can be seen as functioning somewhat like a ‘group life insurance policy’ for all of its players. But there has been a mismatch between premiums paid and withdrawls from the fund for many years now due to the disappearance of great numbers of the larger spawn producers. As a result, premiums have recently been raised for everyone…hence we see spawn production by ever younger organisms of all the involved species… The exact trigger for the early onset of maturity might be a biochemical signal from the plankton, or it could be an internal thing as simple as a slowing of the somatic growth rate, which is another widespread trend in marine life today. THE VARIETY OF SPAWNING BEHAVIORS IN MARINE FISH: does this represent a co-operative effort to maximize the survival of all, or is each species acting solely ‘in its own interest?’…And why are fish eggs always so small? The suppliers of fish eggs and larvae to the ocean spread their contributions throughout the year. Coexisting fish species in temperate zones stagger their spawning times to quite a large extent. Winter is the least favored time, although winter spawning does occur (e.g. sand lance, pollock). Within single species, especially the dominant ones such as cod, the season of spawning may be spread over several months. Others, notably herring, have stock components that spawn in spring and others that spawn in fall. Larger individuals within a stock begin to release spawn earlier, so when the large standing stocks of older fish existed in the sea, presumably spawning seasons were protracted to a somewhat greater degree even then they are today, extending the egg feeding season for their consumers. Why do fish stagger their spawning periods? To minimize the food competition experienced by their young perhaps, but perhaps also to provide year round benefit to the consumers of fish eggs and larvae, including the zooplankton? The second result will happen as surely as the first. In nature, seasonal supplies of food tend to be nicely synchronized to the times when they are most needed by the consumers. This is a characteristic of interdependent species that have evolved together, and can easily be seen in both terrestrial and marine ecosystems. In northern temperate zones, at least, spring and summer are very popular times for spawning, most species (fish and invertebrates) releasing their eggs at this time. Does this provide the best possible feeding environment for the young fish, or is a second ecological purpose also being served by this choice of timing? The North Atlantic ocean experiences a major bloom of phytoplankton in the spring due to strong physical forcing. Zooplankton also increases in response to this, as well as in response to the ‘spawn bloom’ that also occurs at that time of year. Spring therefore should be a very good time for a small fish to be born that must feed itself, even temporarily, on plankton. As the summer progresses, thermal stratification of the water column occurs and the standing stock of phytoplankton becomes markedly diminished. Surface waters become relatively depleted of dissolved nutrients and phytoplankton productivity drops off during the summer months. Many fish do not release their spawn until summertime however…and timing their births to the season of lower phytoplankton density might at first seem to be less than ideal. This might place the young fish at a feeding disadvantage compared to the spring hatched species. But is there another ecological benefit derived from a large release of fish spawn during the summertime? The appearance of fish eggs and larvae in surface waters at this time helps to ward off nutrient depletion of surface waters, which helps to maximize primary production by the phytoplankton during the time of greatest sunlight exposure. It is interesting that the summer spawned eggs are most commonly the floating type. Fish spawn released during summer months helps to sustain the growth of the zooplankton, which are then more able to both feed on and to fertilize the phytoplankton. Continuing to make fertilizer available to the plants throughout the summer ensures their best growth, and this goal is well served by the summertime spawning habits of so many fish. The timing and habitat selection of the spawning habits of one species can often be seen to offer timely food supplies to another. Beyond the examples given of summertime zooplankton augmentation by fish spawn, and the ‘groundfish-baitfish’ spawn feeding reciprocity, many other happy coincidences can be found. For another example, the few surviving summer spawned groundfish larvae will typically settle to the bottom after several months of life in the plankton…arriving there in early winter. The young, newly settled bottom feeder arrives just in time to feed on the sticky demersal eggs of the sand lance that are released at that time. ‘Why’ would the sand lance choose a winter spawning season? …And ‘why’ choose to produce a demersal egg? Who knows?… but it seems just possible that at least part of the reason might be the provision of high quality, easily accessible food to tiny, juvenile groundfish exactly at the time that they need it. The continuum of levels of parental care by fish runs the gamut from advanced development of juveniles within the mother’s body (similar to levels of care provided by some terrestrial animals), to some brooding activity and avoidance of predation risk for the young…to the opposite extreme: reproductive strategies that amount to serving up the spawn precisely to suit the feeding needs of the predators. Virtually delivering the young into the mouths of their chief predators seems to be a strategy followed by some of the more successful fish families in the sea (groundfish and baitfish). The continuum of care has been recognized and described in the literature, but just how ‘careless’ fish can be with the lives of their young has not generally been described. Some spawning strategies seem to be designed first and foremost for the convenience of the spawn predator(!) Yet, this appears to be one facet of a highly successful community of aquatic organisms that has evolved over millions of years, with all of the necessary checks and balances in place to ensure continued survival. Their common dependence on the zooplankton, the nursery and first food for all of their young, dictates the importance of continually maintaining this crucial element of the system. Perhaps this is the reason that producing such huge numbers of tiny floating eggs evolved as the major method of animal reproduction in the sea. Why do even the largest fish produce such tiny, vulnerable eggs? The probability of being consumed at the earliest life stages is so high that, only by dint of their sheer numbers, do a tiny fraction of the offspring of fish avoid this fate and survive to maturity. Life as a tiny planktonic fish egg or larvae is usually quite short, the risk of predation mortality at this stage being far higher than that faced by juveniles that have reached larger sizes and ‘escaped’ from the perilous life in the plankton. Fish have evolved to cope with this awesome risk faced by their young by producing them in huge quantities…or at least that is our usual interpretation of the reason why so many ‘extra’ eggs are formed. A minority of fish have evolved with reproductive strategies that avoid the extreme hazards of early planktonic existence as juveniles (mainly sharks and their relatives). This is accomplished by a greater investment being made into each of a few offspring. The dominant type of fish in the sea however, the ‘bony fishes’ or ‘teleosts’ overwhelmingly have opted to produce sheer numbers of tiny offspring rather than investing more heavily in a smaller number of larger, better provisioned offspring (e.g. providing more yolk per egg). But the reason for this has presented a bit of a scientific puzzle. Scientific analysis of the energetics of this common reproductive strategy used by fish (broadcasting tiny eggs that hatch planktivorous larvae) do not show it as being the most advantageous choice…or at least not the one that will give the highest rate of return (survival of young) for the investment of energy and nutrients. Dispersal of offspring is thought to be an advantage conferred on sessile invertebrates that use the ‘broadcast’ reproduction method, but for mobile adults such as fish, this cannot be argued as an important advantage. It appears (to us) to be especially illogical for the largest fish to continue to produce such tiny, vulnerable eggs and larvae. The giant bluefin tuna, for instance, a top predator (which grows up to 2000 pounds and 14 feet in length), produces an egg that is the same size, or a tiny bit smaller than, that produced by tiny fish such as capelin and smelt, small "baitfish" that grow to a maximum size of about 8 inches long. The eggs of all of these species are in a common size range for many fish eggs, (smelt eggs are .05" in diameter, capelin eggs .04", while bluefin tuna eggs measure .04 -.05" in diameter. (Liem and Scott, 1966)). If the giant bluefin tuna were determined only to maximize the number of its own offspring that survive to maturity, a heavier investment of energy into a smaller number of young that were better equipped to ‘escape’ the plankton should do it. Such a large fish should hypothetically be able to equip its young to have a considerable advantage at the start over the young produced by smaller species. Yet it does not, nor do many other large oceanic fish. The mysterious reasoning behind this, that scientists have not yet been able to explain, may be that reproduction in fish is to a large extent in fact designed to replenish the zooplankton upon which they all ultimately depend. "The type of reproduction that has evolved" in the ocean is, to a very great extent, one that also provides significant quantities of high quality food, in the form of fish eggs and larvae, to a multitude of carnivorous planktivores. The small size of fish eggs ensures that small, yet vital, consumers such as zooplankton can take advantage of them. This suggests that the "reproductive" strategy of fish is in fact designed for this precise purpose, and that "ocean fertilization" is also an important ecological goal of their behavior. The design is such that a few offspring will survive, enough the repopulate the parent species, but that the vast majority will be channelled instead into the maintenance of the carnivorous web…and eggs must be kept very small, even in the largest fish, because it is important to provide food that is appropriately sized to nourish those zooplankton that produce herbivorous young, the tiny phytoplankton consumers who represent the web’s vital link to absorbing the essential products of photosynthesis. An ocean full of fish, each one putting all of its energy into the production of a small number of large, predator-resistant offspring…intuitively this seems unsustainable, especially considering that smaller prey will be required by these fish…therefore ultimately, maintenance of a healthy abundance of zooplankton is a basic necessity and priority for all of them. And this priority is clearly reflected in the dominant style of their "reproductive" behavior, the production of extremely high numbers of very tiny eggs. Effective biological fertilization of the sea involves not only making nutrients available in surface waters to stimulate phytoplankton growth, but also the simultaneous nourishing of a variety of carnivorous consumers, since their sustenance is essential to the repopulation of their juveniles, the essential herbivores. This is what the fish egg appears to have been designed to do. When examined from the point of view of its utility in "ocean fertilization," the fish egg appears to be a particularly clever device. First of all, most fish eggs float. This physical movement shifts protein dense material upwards through the water column, acting to partly compensate for the surface-depleting effect of sinking organic material. A biological "upwelling" therefore also occurs. Once they are positioned within the upper layers of the water, a high proportion of fish eggs are eaten before they hatch. The fish egg is virtually defenceless against its predators, and due to its high protein and energy content, probably represents the most nutritionally valuable food item available in the plankton. The eggs that are not consumed will, after a short while, hatch and transform themselves into tiny fish larvae. During the time (days to weeks to months) that it must live in the plankton, the larva feeds on edible matter that is smaller than itself, accumulating nutrients and energy within its body while slowly and continuously releasing an appropriate dosage of fertilizer for the phytoplankton. As it grows, the fish larva presents itself as a feeding option to a range of ever larger carnivores. Sustaining these carnivores allows those species to continue to live and reproduce, to cycle nutrients back to the phytoplankton, and to feed their own consumers. So the fish egg can be appreciated as a cleverly designed and important biological ocean fertilization device. If it is not consumed in its original presentation, it will automatically transform itself into a slightly different food item that is suitable for an ever-increasing size range of predator. In effect, then, the fish egg can be seen to provide fertilizer not only to phytoplankton and zooplankton, etc. (and most of the food value is extracted at these lower levels), but also a rippling fertilizing effect that is ultimately felt throughout the entire web. 1. The decline in zooplankton production can plausibly be related to the near total removal of many spawn producing marine species from the ocean, an end result of centuries of human fishing. Early failure to recognize the highly carnivorous nature of the zooplankton has perhaps hampered scientific understanding of the significance of ‘animal’ food to zooplankton, including the floating spawn produced by larger organisms. 2. The zooplankton assemblage functions as a "keystone" in the marine ecosystem. It is the link between photosynthesis and the carnivorous web, but its success depends on the continuance of both sides, not just the phytoplankton. Disabling the zooplankton is equivalent to punching out the "keystone" from an arch; its removal will guarantee the collapse of the entire structure. The ultimate result of disappearing zooplankton will be the disappearance of many marine species beyond those that we have specifically targeted by fisheries. 3. Physically forced phytoplankton blooms will predictably persist in an ocean with depleted zooplankton stocks, but efficient uptake of nutrients, fixed carbon and energy into the living web will not. Relatively more sinking, decomposition and denitrification of new organic material will occur instead. Measurements of seawater "greeness" or chlorophyll concentrations can provide no reassurance that primary production is occurring at particularly high levels. In ocean areas and seasons where surface waters tend to become nutrient depleted, this tendency will increase (out of proportion to the increase predicted by rising temperature alone). Species with lower nutrient requirements will become relatively more dominant in the plankton of these areas. Blooms of toxic cyanobacteria and species associated with them (some dinoflagellates) will increasingly form in zooplankton-depleted surface waters, often during summertime. The recent global rise in harmful algae blooms and the occurrence of toxins in seafood is therefore predictable. 4. Protection and maintenance of the zooplankton is vital. Recognizing the extent of their carnivorous nature, and their vulnerability to food limitation, should help us to realize that maximizing the production of ‘all spawn’ in the sea needs to become a management priority. By this reasoning, all continued fishing on spawn-producing species puts the entire ecosystem at increasing risk (i.e. removing large quantities of crustaceans, such as lobster, crab and shrimp, from the fish-depleted and zooplankton-depleted North Atlantic ocean is probably very dangerous). Removing these crustaceans, even though they are currently relatively abundant, invites total collapse of the ecosystem. Their continued existence, and their contributions of spawn to the zooplankton, are probably helping to prop up the faltering zooplankton population. From the point of view of the zooplankton, one egg or larva is essentially just as good as another (all will be happily consumed - size, not species, determines the acceptability of these food items to predators). Therefore, greater numbers of crustacean spawn may currently be providing partial compensation for the missing numbers of fish spawn. This needs to be recognized and considered in planning "ecosystem management." Fishery managers are struggling, without much success, to move away from a "single species" assessment and management style to a comprehensive "ecosystem approach." It is time for a radical leap in thinking, and ‘zooplankton conservation and protection’ should provide a useful concept. If the zooplankton decline continues, it is predictable that a threshold will be reached after which rapid collapse of the system will occur. An adequate food density is critical to the survival of all of the organisms involved, and the ‘watering down’ of the zooplankton will not be tolerated beyond a critical level. Blaming this trend entirely on "global warming" is unfortunately reminiscent of the excuses that we have always made for the disappearance of marine species over the years. Blaming the damage on "global warming" is another way for fishery managers to say "there’s nothing that we can do about it." FISHING is now clearly implicated in this global disaster. It’s time to face up to the reality of the extent to which this activity of ours has contributed to the utter ruin of the ocean. 6. It will be far more difficult to put the marine ecosystem back together than it was to take it apart. For several years I have been suggesting that, besides stopping fishing, we should be ‘feeding the fish’ to aid the recovery of the stocks. Recognizing that pouring liquid sewage into harbours and estuaries does not effectively stimulate the growth of fish stocks, I reasoned that distributing sold edibles offshore (my best suggestion was that we somehow use human food waste) might be a better way to ‘feed’ what appears to be a starving ecosystem. That plan, if carried out thoughtfully, might possibly help to increase standing stocks of some spawn producers…but whatever we do in our last ditch attempts at ‘ocean fertilization’ will never match the elegance of the original design…the fish egg. This diagram is typical of what is found in current marine ecology texts. His caption: "This diagram illustrates the flow of nutrients (cyan arrows) and energy (yellow arrows) through several trophic levels in a hypothetical system. 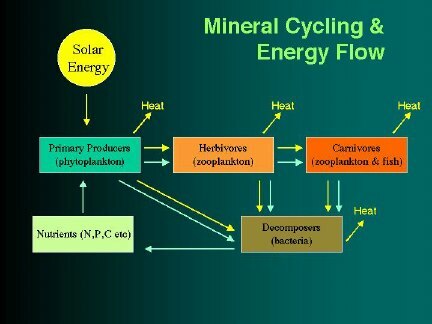 Note the cyclical flow of nutrients and unidirectional flow of energy." This gives the impression that the energy taken in by carnivorous zooplankton is derived only from the consumption of smaller herbivorous zooplankton, and this has been the usual interpretation of zooplankton carnivory. Significant consumption by zooplankton of the spawn of larger organisms, however, requires the addition of a few more arrows to the diagram. Also implied in the usual interpretation is that herbivorous zooplankton can thrive and reproduce on a complete diet of phytoplankton, which fails to acknowledge that many of these organisms will mature into carnivorous adults. Diagram showing representative examples of "tight" cycles within a temperate marine system. Energy flow (yellow) is seen to also flow in cyclical routes within the web, although the amount would be ever-diminishing, the downward diversion of energy via spawn (yellow/red) acts as a catalyst to accelerate the total rate of carbon uptake. The green lines indicate the pathways of regeneration of dissolved nutrients in the photic zone. Bertness, Mark, D., Steven D. Gaines and Mark E. Hay (eds), 2001. Marine Community Ecology. Sunderland, Massachusetts: Sinauer Associates Inc., Publishers. Hempel, Gotthilf. 1979. Early Life History of Marine Fish: The Egg Stage. University of Washington Press. IGBP Report 40. GLOBEC Report 9. 1997. Ocean Ecosystem Dynamics (Globec) Science Plan. Stockholm, Sweden. Kerfoot, W. Charles and Andrew Sih. 1987. Predation: Direct and Indirect Impacts on Aquatic Communities. University Press of New England. Lasker, Reuben (ed) (undated book(! ), circa 1980) Marine Fish Larvae-Morphology, Ecology, and Relation to Fisheries. University of Washington Press. Nielson, E. Steemann. 1971. "Plankton Production" in Nybakken, James W. 1971. Readings in Marine Ecology. Harper and Row Publishers, New York. Orr, A. P. and S. M. Marshall. 1969. The Fertile Sea - being the Buckland Lectures for 1957. London; Fishing News (Books) Limited.